We offer commercial grade floor coating systems at a fraction of the cost of installation for any residential or commercial area. Our floor coating systems include a lifetime warranty against peeling, blistering and “hot tire” pick-up. 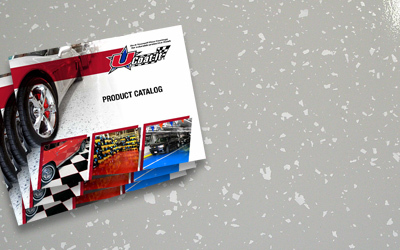 Get your catalog today and learn why you should choose UCoat It! Your privacy is important to us. Click here to view our Privacy Statement. All Images and content of this site C 2018 UCoat It America, LLC. All rights reserved. UCoat It America, LLC is a privatly owned company based in Royal Oak, MI, USA. All registered product names are exclusive property of UCoat It America, LLC and may not be reproduced. This site is maintained by UCoat It. For sales or techincal support call 1-800-826-2848.